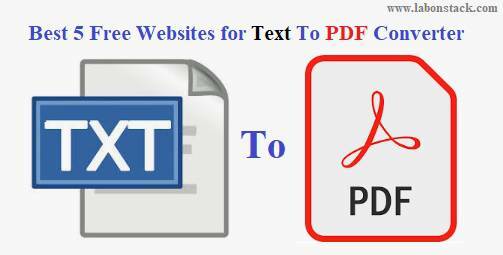 Here I have listed best 5 free websites for text to PDF converter. If you want to convert text to PDF document that these sites will be very useful for you. Here in this list, some sites convert one text file to PDF at a time and other sites convert multiple files to single PDF document. Take one note these here they automatically select font and text size for the output PDF file and sure output look very good. Many other features are available in these text to PDF converter websites like you can create a separate PDF for each text file, convert PS, password protect output PDF, EPS, DOC, DOCX, HTML, and many other files, lock printing and modification permission for PDF file, and more. You can easily change your Text files to PDF with this online tool. Furthermore, Online PDF Converter offers many more features. Just select the files, which you want to merge, edit, unlock or convert. Online2PDF is one of my favorite PDF suite websites. Its text to PDF tool is also available which is better than some other text to PDF conversion websites. Using its text to PDF feature, you can add multiple text files (up to 150 MB for all files and up to 100 MB for a single file) from your PC. Your uploaded files are not saved by this website and other data is deleted after the conversion. There are many options that you can use before creating the final output. For example, you can set the password for PDF, lock printing, create one PDF for all text files, add header and footer to PDF, create separate PDF for each text file, and etc. FreeFileConvert is an online & free tool to convert text files to pdf. This website also supports feature to upload a text file from Dropbox and Google Drive for conversion. Also, there is no per hour limit for text file conversion. In this online converter tool, the output PDF can be downloaded maximum 5 times or up to 24 hours. The size limit for input files is 300 MB, which is another good feature. They prepare separate PDF for each text file and it is possible to download all those PDF files one by one. You can use Soda PDF for multi-purpose. For example, you can merge PDF, compress PDF, PDF signature, PDF splitter, and other tools. Their best tool is text to PDf converter. Your added text file and output PDF remains for 24 hours and Soda PDF Online removes them after that time period. All its features are simple and very good but the only thing is that the free plan lets you convert 2 files in an hour. It is possible to add text file from Dropbox, Google Drive, or PC and start the conversion to generate the output PDF. A multipage PDF file is created which you can download to PC or receive as an email by providing your email address. This is the best tool to convert text file to PDF but they provide facility to convert only one TXT file. They provide 128 MB size limit which is more than sufficient for text file. Here very simple to convert the text file into PDF like Add text file, use Convert Now! button and it will produce the output. You get sufficient time to save the PDF to PC. The output file remains to download for 2 hours and finally, the website removes it. You can save PDF with a single click to your PC. This website also lets you convert many other files like HTML, DOCX, PPTX, DOC, XML, EPUB, EPS, PS, etc. This is my favorite website to convert file from TXT to PDF. Using this tool you can convert only one text file. Your output PDF can be downloaded until 24 hours and/or 10 times. It is possible to add TXT from PC or add URL of online TXT file. You can set size (height and width) for output PDF, or leave it to generate PDF with default height and width.